OTTAWA (Reuters) - Many Canadians question why Ottawa should ratify a new North American free trade deal given Washington's refusal to lift U.S. tariffs on imports of steel and aluminium from its northern neighbour, a top Canadian official said on Monday. 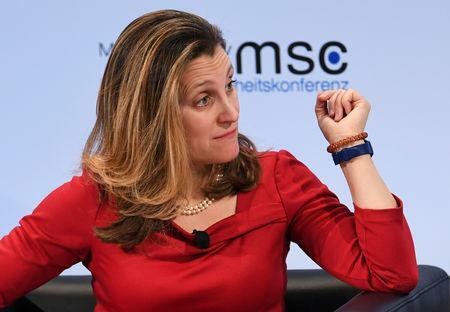 Foreign Minister Chrystia Freeland made her remarks to reporters in Washington after meeting U.S. Trade Representative Robert Lighthizer to insist on the removal of the sanctions, which the U.S. administration announced last May, citing national security reasons. Canada is the single largest supplier of both aluminium and steel to the United States. Freeland said it made no sense to retain the tariffs, given that the U.S.-Mexico-Canada free trade agreement had been formally signed last November. "I have heard from a lot of Canadians that they would be really troubled by Canada moving forward with ratification while the tariffs are still in place," she said in televised remarks. Freeland did not answer directly when asked whether she had made any progress in trying to persuade Lighthizer to lift the tariffs. Washington worries that countries could try to ship supplies through Canada and pretend the metals had been produced in Canadian facilities. Prime Minister Justin Trudeau spoke to U.S. President Donald Trump on March 1 about the matter but well-placed sources said there was little sign of progress.